Zoanthids are rightfully beloved by nearly all marine aquarists. They are often bright, uniquely colored and fast-growing. Because they are generally hardy, they make an excellent choice for the beginning aquarist; however, the rarer color patterns tempt even experienced reef aquarists. Despite their popularity, many aquarists are unclear of zoanthids relationship to other marine animals, especially those that we commonly call coral. On the one hand, zoanthids look like miniature sea anemones, yet they also seem to resemble soft corals such as the Glove Polyps pictured below (Clavularia species-pronounced "klav-yoo-lahr-ee-ah"). In truth, zoanthids are neither anemones nor soft corals-so what are they? Let's start with some basics. Zoanthids, like all of the animals we typically call "coral" in the marine aquarium hobby, are cnidarians (pronounced "nigh-dare-ee-yans"). More specifically, zoanthids are part of the class Anthozoa, which includes the soft and leather corals, sea anemones, mushroom corals and stony corals (and exclude other cnidarians such as fire corals, lace corals, jellyfishes, and sea wasps). Anthozoa, as a word, originates from Greek ("anthos" and "zoion") and translates roughly as "flower animal," which is an apt name for most zoanthids. Like sea anemones, mushroom corals and stony corals, zoanthids are called hexacorals because they have polyps with tentacles in multiples of six (octocorals, on the other hand, have eight tentacles). Zoanthids, unlike the "true" or stony corals (what hobbyists generally term SPS and LPS) lack skeletons, but they are also not soft corals (which are all octocorals). 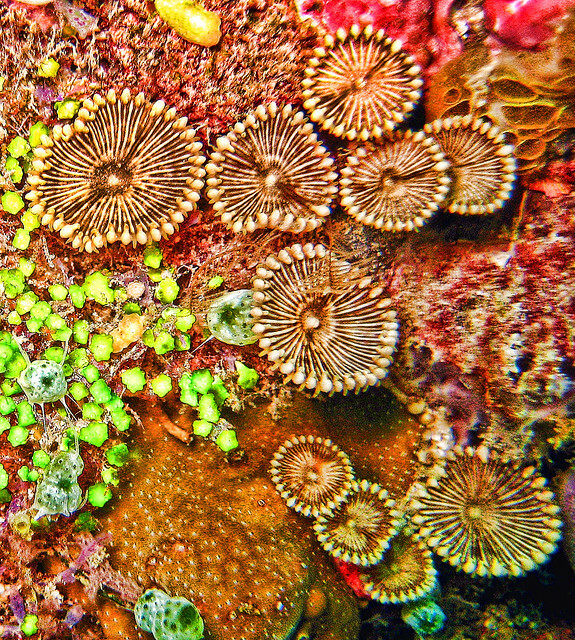 The polyps of zoanthids are either solitary or embedded in so-called mats. Solitary polyps are often connected to other polyps by runners (called stolons, pronounced "stoe-lahn"), while mat polyps embed themselves in a tissue matrix or mat (called a coenenchyme and pronounced "see-nehn-kyme"). When the aquarist looks at a zoanthid polyp, they are generally focused on the oral disc. Each zoanthid polyp has a mouth (called a siphonoglyph and pronounced "sye-fah-no-glif"), which is part of the oral disc and generally surrounded by two rings of tentacles. Like all cnidarians, zoanthids possess nematocysts (pronounced "ne-mat-oh-sist") or stinging cells (the word cnidarian translates from the Greek as "stinging nettle"), which assist in food capture. When it comes to defense, however, it is a toxin called palytoxin, which keeps most predators (including the aquarist) at bay. It is common to tout the fact that most zoanthids are easy to keep and require no supplemental feedings. While it is true that many of the commonly available zoanthids are zooxanthellate (zoo-zan-thuh-late) and host symbiotic zooxanthellae (zoh-zan-thel-ee) in their tissue, the reality is that nearly all zooanthids rely on particulate food and plankton capture to sustain their metabolism. As a result, nearly all should be target fed in captivity (in addition to providing appropriate lighting). It is very difficult to identify individual species when dealing with zoanthids. That is why you frequently see them sold by their genus name (e.g. Zoanthus spp.) and a creative description of their coloration (e.g. Halloween Zoanthids). Zoanthids are often (there is much debate that is well beyond the scope of this article) divided into several families. The most frequently seen zoanthids in the aquarium trade are from the families Parazoanthidae and Zoanthidae. Within the family Parazoanthidae, the genus Parazoanthus (pare-ah-zoe-an-thuss) is particularly popular (e.g. Yellow Polyps), while the Zoanthus (zoe-an-thuss) genus (e.g. Z. pacificus and Z. sociatus) and the Palythoa genus (which is now often seen as being congeneric and nearly conspecific with the genus Protopalythoa) are the most commonly represented genera from the family Zoanthidae. 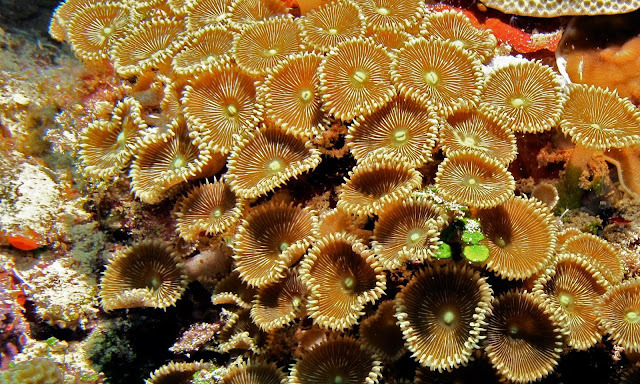 So-called Acrozoanthus (ak-roh-zoe-an-thuss) or Stick Polyps are also seen with some frequency in the hobby and are usually classified as belonging to the family Zoanthidae. Species from the genus Parazoanthus are the most common in this family, and, as species identification is uncertain, most are sold as Parazoanthus spp. or simply Yellow Polyps. Although called Yellow Polyps, their coloration can vary from a cinnamon-brown to a bright yellow, with some species even taking on a red color (e.g. P. puertoricense). The polyps reproduce by budding at the base of the parent polyp, and they form colonies in this way that encrust rocks, shells or vacant worm tubes. Some Parazoanthus species live commensally with other organisms (e.g. sponges), but most of the specimens seen in the hobby contain symbiotic zooxanthellae within their tissue and, given sufficient light, will do quite well with only periodic target feedings. The fact that many Yellow Polyps are indiscriminate feeders means that they often survive in a mature aquarium without any target feedings. This fact, however, should not deter the aquarist from at least weekly target feedings of zooplankton-type foods. Moderate light, moderate to strong intermittent flow and supplemental feedings are the key to success with these attractive zoanthids. Recent research has found a remarkable similarity between the genus Palythoa and Protopalythoa, and so we will mostly deal with them together here. If there is a difference apparent in the aquarist, it is in the fact that Protopalythoa species' polyps (e.g. Button Polyps, Protopalythoa spp.) are often not embedded in the tissue matrix or mat, while Palythoa (pal'-ee'-thoe'-ah) species' polyps (e.g. Sea Mat or Encrusting Colony Polyp, Palythoa spp.) are. All have broad, flat oral discs surrounded by tentacles (perhaps more tentacles on Protopalythoa species). The discs may be brown, brownish yellow or even a cream color, and some have quite attractive fluorescent accents and striations. Sometimes the oral disc will be darker than the mat in which it is embedded, again, making for a nice display. All are fairly light tolerant and prefer moderate to high flow. As with all zoanthids, they will benefit from targeted feedings, and those with long tentacles and broader oral discs may require more direct feeding. One word of warning: be careful, as many of these zoanthids are competitive and will easily overgrow adjacent corals. The Zoanthus genus is often the best-represented genus from the family Zoanthidae, and it is most frequently what people think of when they think of zoanthids. There are many species, and most are simply identified for the aquarist by their remarkable color schemes. The polyps are generally small with dramatic contrasting colors between their oral discs and tentacles. These animals rely heavily on zooxanthellae, so much so that some aquarists claim no food response occurs as a result of targeted feedings. In reality, this is probably because Zoanthus species are more selective in their feeding, but regardless, it is essential to place them in high light environments to sustain their zooxanthellae populations. Given the proper environment, these zoanthids are hardy, fast-growing animals that reproduce by budding and will rapidly spread across your live rock in a colorful display that will ad interest and beauty to your reef tank. In conclusion, zoanthids are, generally speaking, highly interesting, attractive and hardy animals. They can add color to almost any reefscape, and they require little in the way of specific husbandry. Most grow quickly in captivity, and their collection from the wild generally has a little detrimental impact on natural ecosystems. Zoanthids are often the first cnidarians introduced to the beginning aquarist's tank, but the more uniquely colored and rarer species are equally coveted by advanced aquarists. In short, zoanthids offer something for everyone.